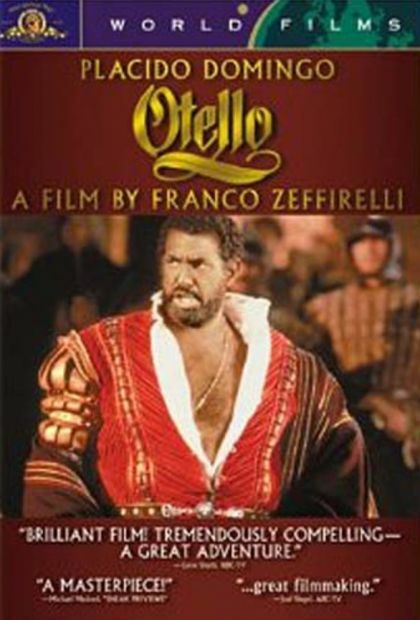 Plot Having previously staged Verdi's 1887 opera Otello at the Met and La Scala, filmmaker Franco Zeffirelli committed his production to film in 1986. Starring as the fatally jealous Moor of Venice is Placido Domingo, who had also headlined Zeffirelli's 1976 La Scala staging (production on the film was briefly interrupted while Domingo participated in the rescue operations following the Mexico City earthquake). While Katia Ricciarelli as Desdemona and Justino Diaz as Iago perform their own singing, Zeffirelli's Cassio--played by real-life European prince Urbano Barberini--is dubbed by Ezio de Cesare. The director made several cuts in the original libretto and score in order to accommodate the film's two-hour time limit, but these excisions are done with taste and discretion. Because of the excessive violence in the third act--two murders, a suicide, a superficial throat-slashing--Otello was released with a PG rating.